The Brassicaceae is a large, widely distributed family including 375 genera with about 3200 species of plants whose typically cruciform flowers have four petals, hence the old name Cruciferae for the family. Leaves are alternate, rarely opposite or may be organised as rosettes. 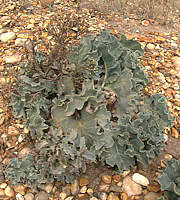 Many members of this family produce pungent glucosinolate compounds containing sulphur and nitrogen, with the characteristic odour of mustard or cabbage from crushed leaves. 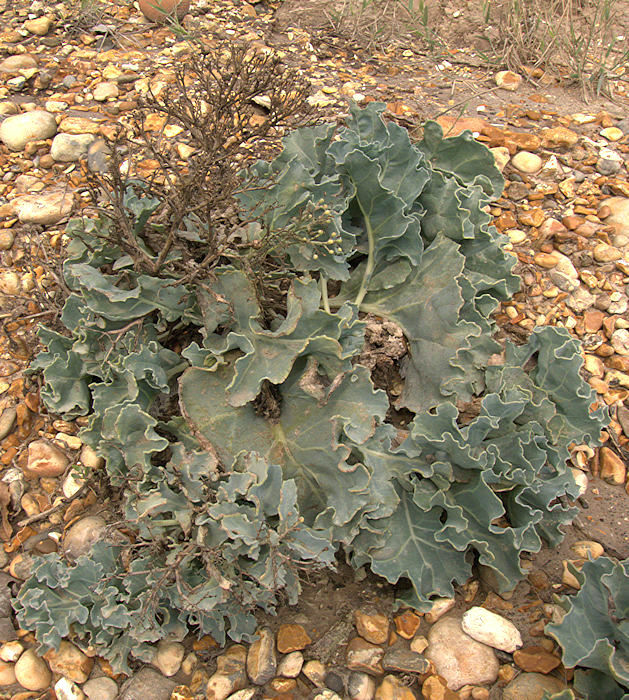 Succulence is not well developed in the family Brassicaceae but there are a few salt-tolerant succulent plants native to coastal margins. 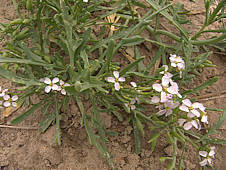 The genera Lepidium and Heliophila have several succulent members. Members of the Brassicaceae (cabbage, caper, kale, mustard, turnip) are important agricultural crops grown for food and fodder. Some have caudiciform roots and succulent leaves but are not usually shown as succulent plants. is an annual edible succulent plant with elongated, multilobed fleshy shiny green leaves and white to pink cruciform flowers in late Summer. The ovate fruits become corky and are dispersed by floating on sea water. 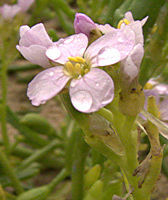 Native to coastal margins of Europe and has been introduced elsewhere. 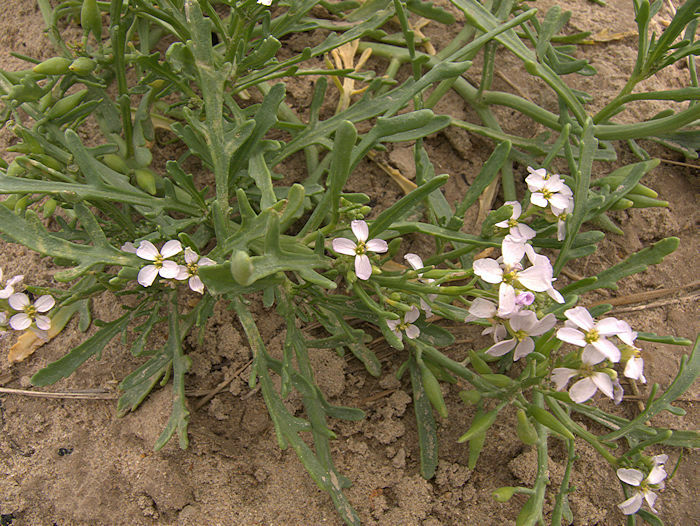 The leaves, stems, flower buds and immature seedpods are rich in Vitamin C and may be eaten raw or cooked. However, the seeds contain erucic acid, which can be cardiotoxic. 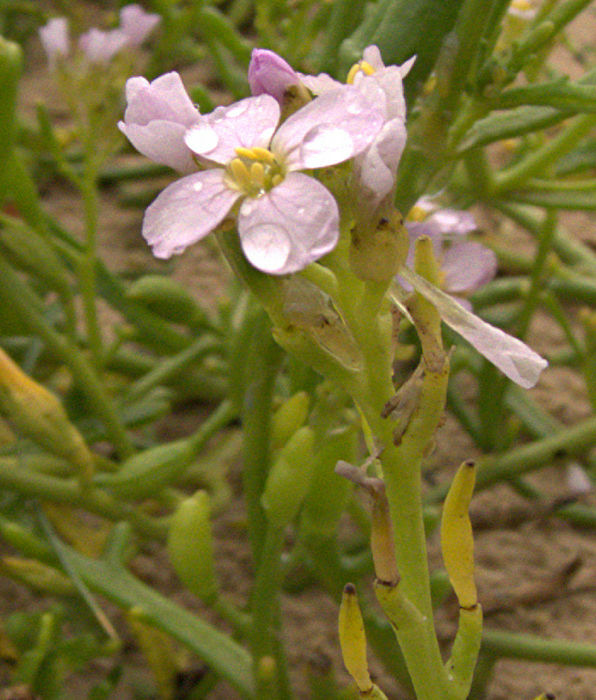 Left: Growing in sand at Hengistbury Head, Dorset. is a perennial edible succulent plant with thick blue-green waxy leaves and a white fleshy tap root. In late Spring large clusters of white flowers are produced, followed by round seed pods. Native to the coasts of continental Europe, often growing in shingle or sand, and introduced to Britain, Ireland and the Channel Islands. Left: Growing in shingle at Hengistbury Head, Dorset.